The LED (PRK) pan-style retrofit kit is designed to replace existing fluorescent including prismatic troffers, direct/indirect luminaires, volumetric luminaires and parabolic luminaires. 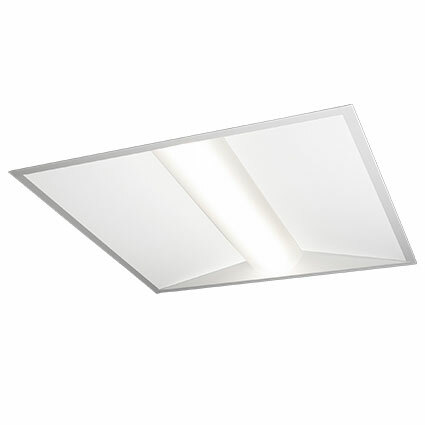 The PRK, equipped with a 0-10V dimmable LED driver, will retrofit 1-by-4 foot, 2-by-2 foot and 2-by-4 foot fluorescent recessed fixtures to high-quality LED. Four CCT options 3000K, 3500K, 4000K and 5000K. With a range of configuration possibilities and a five-year limited warranty, EVERLINE PRK upgrades the light distribution as well as the light engine, making it an ideal option for installers working on a variety of applications including offices, classrooms, lobbies, corridors and other commercial and institutional spaces. The light engine, a top-performing EVERLINE LED driver and high-efficacy LED modules, is easy for technicians to install and will provide controllable lighting for virtually any recessed retrofit. The EVERLINE PRK’s design features a heavy gauge steel housing and aluminum LED tray finished with corrosion- and scratch-resistant white enamel that offers impressive durability and improved optics. The kit, which is UL Classified 1598C in the United States and Canada and specified for 120- 277VAC or 347VAC power configurations, also offers excellent light quality with a Color Rendering Index (CRI) of 80.